Satellite data indicates the Arctic is facing a decline in sea ice that could equal or even beat the negative record of 2012. 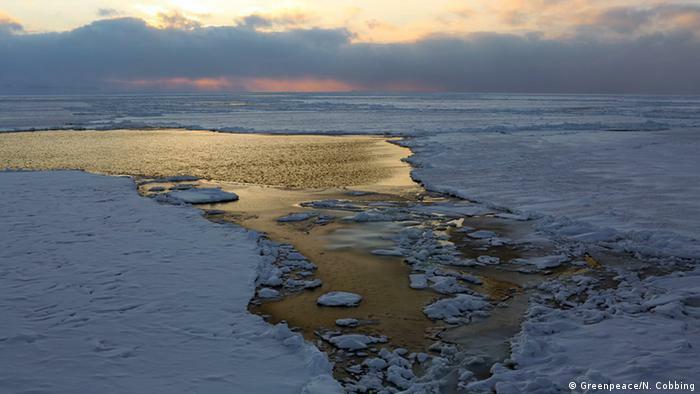 Sea ice physicists from the Alfred Wegener Institute, Helmholtz Centre for Polar and Marine Research (AWI), anticipate that the sea ice cover in the Arctic Ocean this summer may shrink to the record low of 2012. The scientists evaluated current satellite data on the thickness of the ice cover. The data shows that the Arctic sea ice was already extraordinarily thin in the summer of 2015 and comparably little new ice had formed during the past winter. Speaking at the annual General Assembly of the European Geosciences Union meeting 2016 in Vienna, AWI sea ice physicist Marcel Nicolaus said data collected by the CryoSat-2 satellite revealed large amounts of thin ice that are unlikely to survive the summer. 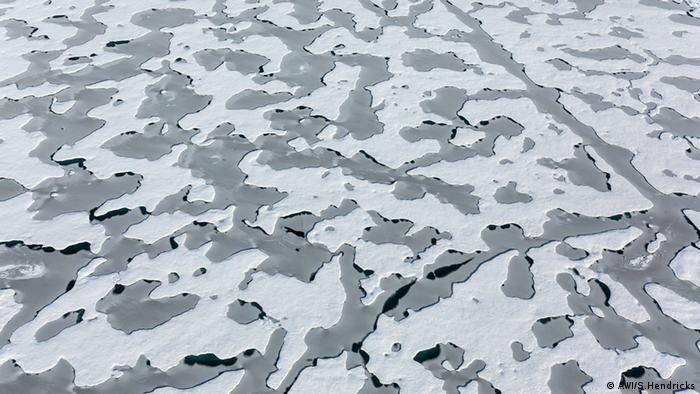 Much of the sea ice is thin and patchy. Predicting the summer extent of the Arctic sea ice several months in advance still poses a major challenge. Until the end of the melting season, the fate of the ice is ultimately determined by the wind conditions and air and water temperatures during the summer months. However, conditions during the preceding winter lay the foundations. The AWI scientists say this spring, conditions are as “disheartening as they were in 2012,” when the sea ice surface of the Arctic went on to reach a record low of 3.4 million square kilometers in September. At the end of March, the Arctic sea ice was at a record low winter maximum extent for the second straight year, according to scientists at the National Snow and Ice Data Center (NSIDC) and NASA. Air temperatures over the Arctic Ocean for the months of December, January and February were 2 to 6 degrees Celsius (4 to 11 degrees Fahrenheit) above average in nearly every region. AWI scientists take measurements on the ice. This year’s maximum winter extent was 1.12 million square kilometers (431,000 square miles) below the 1981 to 2010 average of 15.64 million square kilometers (6.04 million square miles) and 13,000 square kilometers (5,000 square miles) below the previous lowest maximum that occurred last year. Ice extent, the area of ocean where there is sea ice, increases through autumn and winter, and the maximum typically occurs in mid March. Sea ice then retreats through spring and summer and shrinks to its smallest or minimum extent typically by mid September. The September Arctic minimum began drawing attention in 2005 when it first shrank to a record low extent over the period of satellite observations. It broke the record again in 2007, and then again in 2012. The March Arctic maximum tended to attract less attention until last year, when it was the lowest ever recorded by satellite. Larissa Beumer was one of a team of Arctic experts on board the Greenpeace ship the Arctic Sunrise, which has been checking the ice conditions in the Arctic archipelago of Spitsbergen. From the ship, she told DW the ice conditions were “catastrophic and way outside of normal variations.” She reported hardly any of the fjords on the west coast were frozen over and there was generally less ice on the east coast. She said local residents were experiencing transport problems, with many of the usual routes inaccessible by dog sled or snow mobile. Beumer said most of the ice is fresh, one-year ice, with open water in between and a lot of breaks in it. The Greenpeace ship Arctic Sunrise encountered surprisingly little ice in places normally thickly covered. AWI scientist Marcel Nicolaus says new ice only formed very slowly in many regions of the Arctic, on account of the particularly warm winter. “If we compare the ice thickness map of the previous winter with that of 2012, we can see that the current ice conditions are similar to those of the spring of 2012 – in some places, the ice is even thinner,” he told journalists at the Vienna Geosciences meeting. Nicolaus and his colleague Stefan Hendricks evaluated the sea ice thickness measurements taken over the past five winters by the CryoSat-2 satellite for their sea ice projection. They also used data from seven autonomous snow buoys, which they placed on ice floes last autumn. These measure the thickness of the snow cover on top of the sea ice, the air temperature and air pressure. A comparison of their temperature data with AWI long-term measurements taken on Spitsbergen has shown that the temperature in the central Arctic in February 2016 exceeded average temperatures by up to 8 degrees Celsius. In previously ice-rich areas such as the Beaufort Gyre off the Alaskan coast or the region south of Spitsbergen, the sea ice is considerably thinner now than it normally is during the spring. “While the land- fast ice north of Alaska usually has a thickness of 1.5 meters, our US colleagues are currently reporting measurements of less than one meter. Such thin ice will not survive the summer sun for long,” Stefan Hendricks said. The scientists say all the available evidence suggests that the overall volume of the Arctic sea ice will decrease considerably over the course of the coming summer. They suspect the extent of the ice loss could be great enough to undo all growth recorded over the relatively cold winters of 2013 and 2014. “If the weather conditions turn out to be unfavorable, we might even be facing a new record low,” Hendricks concluded.